Sean Snyder takes the global circulation of data as the raw materials for his practice. He experiments with multi-layered signs revealing unexpected layers in an intentionally non-pedagogical way. Refusing to conform to conventions, his practice avoids simple classification. In resistance to contemporary art's tendency to aspire to a mechanized consumer society, his investigations parody and mirror their processes. Bypassing conventions, the artist's practice encodes information using an unpredictable matrix. Anatomically ordering preconceptions, his installations deconstruct assumptions that might be attributed to a topic. Interrogating representation, the nebulous investigations, occasionally come into clear focus oscillating between fact and fiction. What might seemingly be intelligible, might turn out to be far more complex. Conversely, what may apparently be complex, might unravel in multi-farious, yet simple and uncomplicated ways. Researching algorithms and unknowns, his practice dissects the aleatoric use of databanks and publicly attainable information, producing unexpected (and subjectively) interconnections between memory and materiality. Via a deconstruction and reconfiguration of components, he elucidates hypotheticals from incongruent perspectives. Sean Snyder was born in Virginia Beach, USA and now lives and works in Berlin, Germany. Recent solo exhibitions include 'Eye of the Huracán', Schloss, Norway (2016); 'Aspect Ratio / Dispositif', Galerie Chantal Crousel, Paris, France (2016); ‘Re-convergence (Algorithmic Archaeology)’, Document, Chicago, IL, USA (2015); 'No Apocalypse. 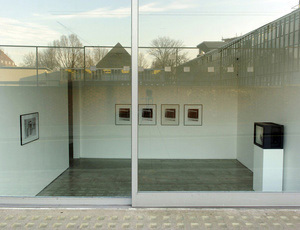 Not Now’, Kölnischer Kunstverein, Cologne, Germany (2013); Artists Space, New York, NY, USA (2010); 'The Real War', Israeli Centre for Digital Art, Holon, Israel (2010) and 'Index', Institute for Contemporary Arts, London, UK (2009). Snyder has recently participated in group exhibitions at Bonniers Konsthall, Stockholm, Sweden (2017); ZKM, Karlsruhe, Germany (2016); Witte de With Center forContemporary Art, Rotterdam, The Netherlands (2015); Nam Juin Paik Center, Seoul, Korea (2015); Barbican Art Gallery, London, UK (2014); Irish Musuem of Modern Art, Dublin, Ireland (2013); and Museum of Contemporary Art, Detroit, MI, USA (2013). His current enquiries can be followed here. Four B / W prints Framed: Each 72.5 x 72.5cm / 28 4/8 x 28 4/8 in. Framed photograph 91.5 x 116.5 cm / 36 x 45 7/8 in. Lightjet print, mounted and framed 90.5 x 60.5cm / 35 5/8 x 23 7/8 in.